Pointing dog. The Stabijhoun is a very versatile dog. He is an all-round hunting dog and has a good reputation as a mole and polecat catcher. The Stabijhoun is related to the Drentsche Patrijshond and Heidewachtel. The Stabijhoun probably owes its name to its versatility. The word Stabijhoun is derived from the words ‘sta mij bij’ or ‘stand by me’, while Houn is the Frisian word for dog and is pronounced "hoon". The Stabijhoun originates in the Frisian forest area. In the early 20th century Stabijhoun and Wetterhoun were regularly crossbred with each other. Thereby, the unique varieties of each were threatened to be lost. In 1938 a group of enthusiastic people of the Kynologenclub Friesland started purifying the two breeds again and in 1942 both breeds were officially recognized. Important names in this process were: J. Bos, T. van Dijk, B. de Graaf and W. Hoeksema. The first standard was dated February 10, 1944. In 1947, the Dutch Association for Stabij and Wetterhounen (NVSW) was established. The NVSW represents the interests of The Frisian Breeds since 1947. The population of the Stabijhoun is currently (2013) more than 6000 dogs worldwide. Functional and powerful built pointing dog. The body is slightly longer than its height at the withers. The overall picture is neither too robust nor too fine. The skin should fit tightly. The feathering on chest, collar, forelegs, trousers and tail gives the Stabijhoun the impression of being longhaired, but the coat should not be excessively long. Sexual dimorphism should be unmistakable. The body is slightly longer than its height at the withers. It is important that the harmony and balance associated with a functional body is in accordance with the size of the dog. Elbow is approximately equidistant from ground to withers. The Stabijhoun guard the yard and keeps it free of mice and rats. The previously common larger type Stabijhoun pulled the milk carts, while the smaller type made his name as a professional mole catcher. This talent made the Stabijhoun popular with the poorer farmers and farmhands. The moleskins were worth a lot of money as linings for the wrists of sleeves and other items. The Stabijhoun was carried in a basket on the bike so that they could cover long distances. The Stabijhoun is very independent and likes to go his own way. The Stabijhoun is affectionate but can also be very headstrong. Patience and a consistent education are essential. In the house or in the yard, the Stabijhoun is a quiet but vigilant dog. With strangers or in unfamiliar situations, Stabijhoun may be reserved at first, but should not be afraid. Dry, without pendulous lips or dewlap. The size of the head is in proportion to the body and sexual dimorphism should be clearly defined. The head exhibits more length than width. The length of the muzzle, measured from the nose to the stop is approximately equal to the length from the stop to the occiput. The expression is gentle, friendly and attentive. Skull: The skull is slightly rounded and also slightly rounded on the sides, not narrow, but should not give the impression of being broad or round. Stop: The skull is sloping gradually to the foreface. Seen from the side, the stop seams more marked due to the developed brows. Nose: Black in dogs with a black and white coat colour. Brown in dogs with a brown and white coat colour. Nose well developed with wide-open nostrils. Muzzle: Strong, tapering gradually to the nose tip, without being snipy, viewed both from above and from the side (wedge shaped). The nasal bridge is straight and broad, and viewed from the side neither concave nor convex. Lips: Tightly fitting, not pendulous and not showing labial folds. Jaws/Teeth: Powerful and complete. Scissor bite. Missing PM1 or M3 is allowed, as is also a duplicate PM1. Cheeks: Barely pronounced. Eyes: Set horizontally. Medium sized, slightly rounded shape with close fitting eyelids, without a visible conjunctiva. The pigment of the iris is dark brown for dogs with black and white coat and a lighter brown colour for dogs with a brown and white coat colour. Ears: The ears are set in an imaginary line drawn from the nose tip through the inside corner of the eyes. When attentive, the ears should not protrude beyond the outline of the skull. The ear auricle is not strongly developed, so the ears are worn smoothly lying against the head. They are moderately long, reaching to the corner of the mouth, and have the shape of a trowel that is not round, but ends in a rounded point. The hair of the ear is a typical feature; at the base of the ear it is quite long then decreases in length gradually with the lower third of the ear being covered with short hair. The hair should be straight, but slightly wavy is allowed. Hair on the ears should not reach longer than the ear itself as it gives an untidy appearance. Strong and rounded, of medium length, but not too long. The neck runs smoothly with a blunt angle to the back line, so that the head is usually carried low. The neck shows no throatiness or dewlap. Powerful, clean cut and well muscled. Top line: Smooth and strong topline. Chest: Deep, reaching to the elbows. Viewed from the front rather broad, so that the forelegs are set wide apart. Ribs well sprung but not barreled. The ribs are deep and long, so the ribcage extends as far back as possible. Elbows must be tight to the chest. Underline and belly: Smooth and reaching far enough to the rear. The belly only slightly tucked up. Length reaching to the hock joint. Not set high. The tail is usually worn down although the last third of the tail may turn up during rest or at a stand. During movement the tail lifts, but should never be worn on or over the back or in a spiral. The tail is round and covered up to the tip with long, dense hair, without curls, waves, or feathering. Instead, the tail has a bushy structure, so the hair around is generously long and thick, giving a full and rich appearance. General appearance: Powerful, muscular and functionally angulated, so the legs are correctly under the body. Forelegs seen from the front standing a bit wide. Shoulder: Shoulder blade close to the chest/body and well laid back. Upper arm: Functionally angulated. Length is equal to or only slightly shorter than the length of the shoulder blade. Elbow: Strong, straight and parallel. Forearm: Strong, straight and parallel. Carpus (Wrist): Powerful, in the front straight, metacarpus. Forefeet: Strong, compact and slightly oval shaped. Toes well arched, closed and facing forward. General appearance: Strong and functionally angulated, without exaggeration. When viewed from the rear, the legs are wide and hocks parallel. Thigh: Of good width and length, well muscled and with functional angulations at hip and knee. Lower thigh: Of good length. Hock joint: Straight, parallel and placed well apart, turning neither in nor out. Metatarsus (Rear pastern): Of normal length. Hind feet: Strong, compact and slightly oval shaped. Toes well arched, closed and facing forward. Powerful, harmonious, with good drive and covering a lot of ground. Viewed front on the Stabijhoun moves a bit broad. During movement, the head is carried low. The tail is carried above the topline with a slight bow during action. Hair: The coat is of medium length and straight on the body with a weather-resistant undercoat. At the most, a slightly wavy coat is tolerated on the croup. With the bushy hair on the chest, collar, trousers and tail, the coat gives the impression of being longhaired. Coat on the head, the front of the forelegs, and on the front of the hocks is short. The hair on the back of the front legs is longer and well developed. On the trousers and the tail, the hair is bushy rather than feathered. A curly coat is not allowed. 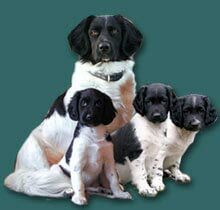 Colour: The Stabijhoun is a pied dog in black or brown with white markings, but also black or brown roans are accepted. The white may have roaning or ticking. The head is black or brown, with or without a blaze. Both of these colours occur with or without plates. Coats with a (distinct) saddle are tolerated. Tan marking or tricolor is disqualifying. Too heavy in head, too wide or round in skull. Curly tail or tail carried over the back. Standing and/or moving with legs too far in under body. Narrow front and flat ribs. Overshot or undershot bite or wry mouth. Any other colour or the absence of white colour.